HUDManiaXiTunes Rewind 2010 iPhoneApp in Japan.Special price $1.99 limited time for ver3.0.0.Will change to price $3.99 from Ver.3.1.0.Presently the 2nd most popular application in Japan!! That`s saying somethingwhen millions of applications are produced by the market leader in technology everyday!! Screen display is out of this world!! An authentic Jet Fighter display with voice command and satellite view. 1. Cockpit //Like a Jet fighter Display. 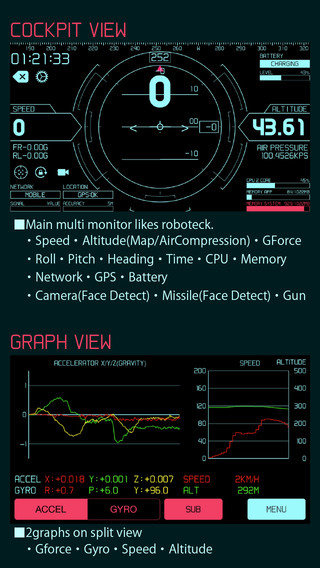 ・Speed ・Altitude(Map/AirCompression) ・GForce ・Roll ・Pitch　・Heading・Battery ・Time ・CPU ・Memory ・Network ・GPS ・Camera(Face Detect) ・Missile(Face Detect) ・Gun2. 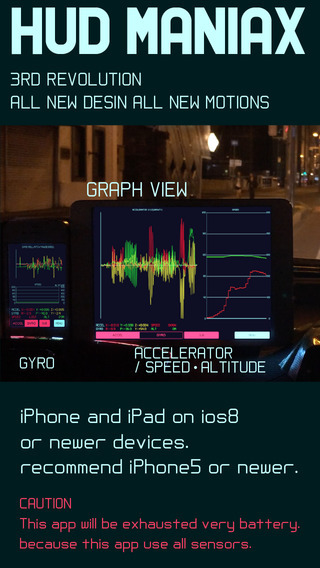 Motion Graphs //2graphs ・Gforce ・Gyro ・Speed ・Altitude3. 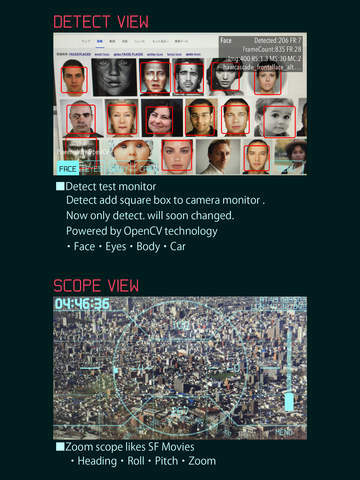 Detect test monitor //Powerd by OpenCV ・Face・Eyes ・Body ・Car4. Scope //Zoom scope likes SF Movies ・Heading・Roll ・Pitch ・Zoom5. Map //GoogleMapSDK ・Import Route files Enabled Download Import from other apps. kml kmz gpx tcx ・Route search for current location to setting location.An incredibly advanced software that makes full use of all your phones sensors.Great for people on foot, train or passenger in a vehicle! 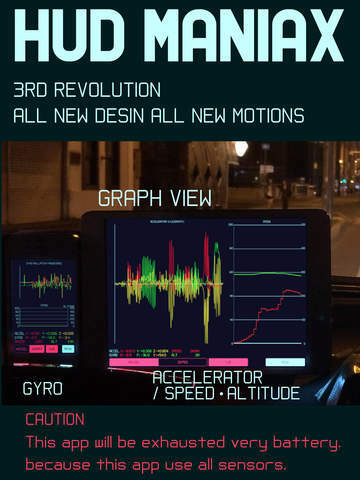 The HUDManaX is for entertainment purposes only.Driver should not use it while vehicle is in motion as it is dangerous. Follow traffic rules and drive safely.This application uses a high amount of battery power. 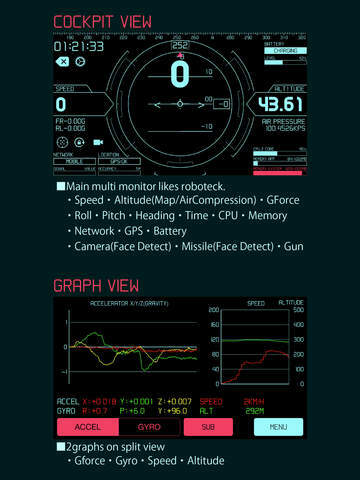 We recommend using it while your iPhone is plugged in to a power source.If you think, "Wow, I can get all these features at the price of a chocolate bar then buy the Human HUDManaX device right away!This app herder for battery.Because It is use all sensors and GPS. 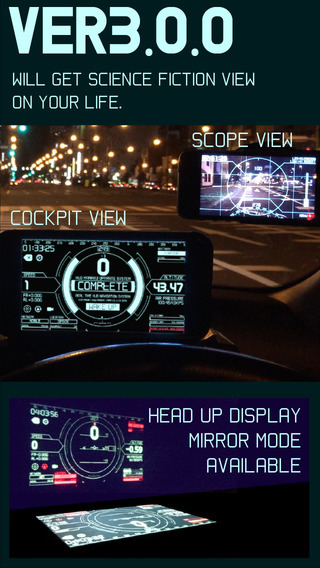 iPhone 5 or Newer recommended or You can use iPhone4s and iPads.Enhance your driving experience today! エンターテイメント系ナビゲーションアプリ「HUD ManiaX( ... 〒063-0001 札幌市西区 山の手１条５丁目２-２.